How much less does a car consume with this new speed limit? Journalists from SUR applied a practical test travelling from Malaga to Seville (197 km) with a passenger car with a turbo diesel engine with average power (Renault Megane), and compared the consumption and travel time with former and current limits. Maximum travel speed of 110 km/h. They annotated about 2,500 revolutions per minute, which has the advantage of less sonority but the drawback of slower recovery in the hills and the difficulty to overtake trucks without exceeding this mark. Consumption was 4.5 liters per 100 km and travel time was 2 hours. Maximum speed of 120 km/h. The speed increased up to 2,900 revolutions per minute. There were no problems in overtaking, consumption was 6 liters per 100 km and travel time was one hour and forty minutes. Conclusion: The new speed limit of 110 km/h will save an average of 2 Euros per 100 km and increase the journey time in ten minutes for every 100 km. 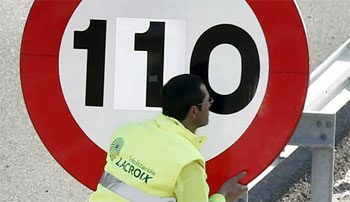 Driving with a speed between 111 and 141 km/h on motorways or dual carriageways will be fined with 100 Euros, while driving between 141 and 160 km/h is punishable by a fine of 300 Euros.